One of the stars of cult sci-fi series Blake's 7 has signed a deal to bring the show back to screens more than 20 years after it ended. 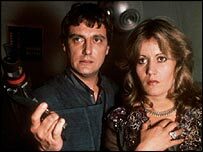 Made as a UK answer to Star Wars or Star Trek, Blake's 7 became a hit between 1978-81 - despite its shaky sets and basic effects. A new TV mini-series, starring Darrow, will have a budget of $5-6m (£3-3.7m), the show's website said. That will lead onto a full series or a string of TV movies, the consortium members hope. Darrow has acquired the rights with producers Andrew Mark Sewell and Simon Moorhead. "British science fiction has remained in the doldrums far too long," Mr Sewell said. "We believe that our plans will deliver a compelling science fiction drama that appeals to the sensibilities of today's audience both domestically and internationally." The new mini-series will pick up the story 25 years on, but Darrow will be the only original cast member to return. A tentative transmission date has been set for spring 2005, its website says - conditional on "many factors, not least financing". The group behind the new show say it has endured better than any other British sci-fi series, and there is a strong global appetite for science fiction. 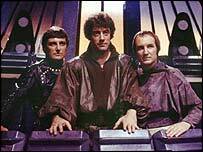 Darrow said: "The programme had such a gritty and dramatic style that was every bit as great an influence on the genre as the original Star Trek."